If you're here for my Waltzingmouse Sketch Challenge card scroll down to the next post. 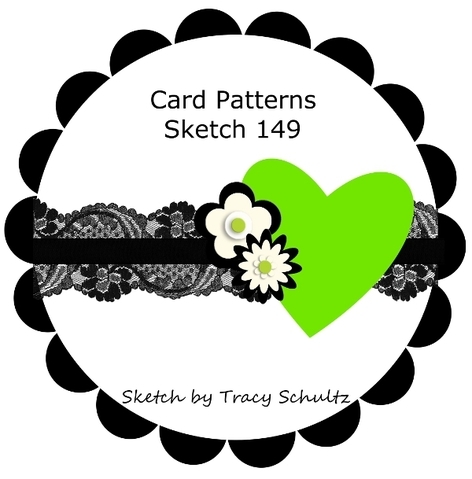 We have a fun sketch this week at Card Patterns, it's a circular shape but you can opt to incorporate it into a square card (like I did!) if you're not fond of circular cards. Here's the fab sketch! I love that sweet heart tucked in there! I also used this week's Trigger Tuesday - Winter Blossoms from Moxie Fab World as inspiration for my card this week. Such a fab trigger this week. I love the soft muted tones and of course the soft, feminine fluffy textures of those pom poms!! I used the colors from the trigger in my card and I made a fun pom pom flower from some tissue paper. The pom pom was very easy to make, I just folded over a length of tissue paper several times, stitched along one side on the sewing machine, then fringed with a scissors and rolled into a flower. The sweet pink crochet heart I bought from Annie Design on Etsy. The patterned papers are from Pink Paislee Nantucket. I love the colors in this collection. I used Spellbinders Big Scalloped Circles Large for my circle and embossed with a roses embossing folder. The Ivory chiffon ribbon and Antique White Twill are both from Craft Fairy. The sentiment is a sticker from We've Got Your Sticker - Forever by SRM Stickers, I also used the white 'Happily ever after' text sticker from the same set to create the background paper below the sentiment. OTHER: CROCHET HEART, BUTTON, MUSTARD/WHITE BAKER'S TWINE, SPELLBINDERS BIG SCALLOPED CIRCLES LARGE, BIG SHOT MACHINE, SEWING MACHINE, CREAM TISSUE PAPER, FOAM PADS. 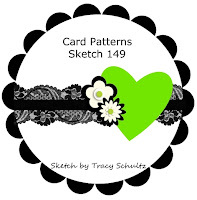 Labels: Card Patterns, SRM Stickers, tissue paper flower., Valentine's card. I love the soft textures on this card. The tissue fringe flower is fantastic! Beautiful job with this week's sketch! Beautiful card! Love your pom-pom flower and the sweet little heart! 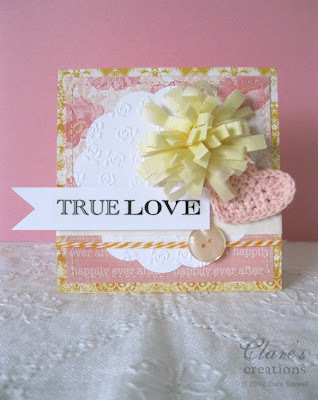 This is so pretty Clare - I love all the textures - that crochet heart, and the embossed doily. This would be a good one for CR84FN this week too. I think you captured the Moxie Fab inspiration photo really well with that big fluffy pom pom and the soft muted colors! Pretty, pretty, Clare! I like the mix of rose embossing, with paper tissue flower, with crocheted heart. Saw this over at Tuesday Trigger. Have a great day! 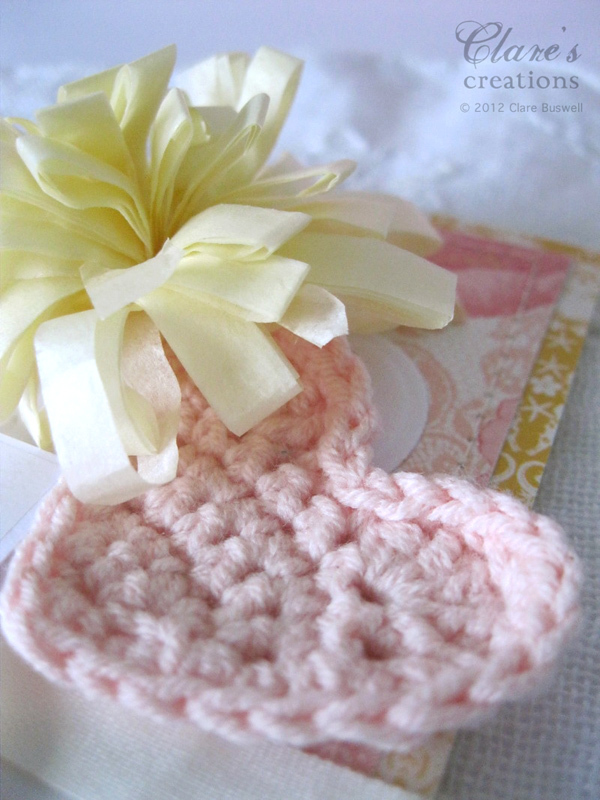 I just love the little crocheted heart you added- it's adorable! This is beautiful! Love the flower & how you layered the elements. Clare, congrats on being chosen at Moxie Fab World for this! Hooray! CUTE CARD!! I LOVE the pom-pom flower!! CONGRATS on the winning design!! =) Have a FABULOUS WEEK!! Congrats on the win over TT!Love all the elements! You really put SRM Stickers in GREAT use!! WAY TO GO, Clare! 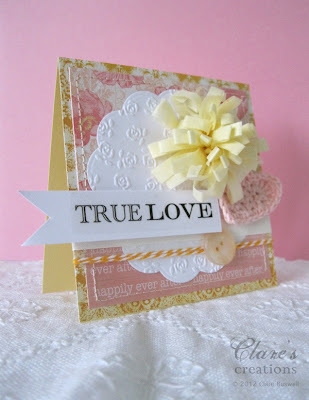 Clare, your creations are always fabulous and this one is to swoon over!! 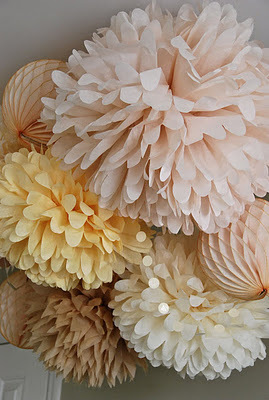 The pom pom flower is terrific - such a fun idea! 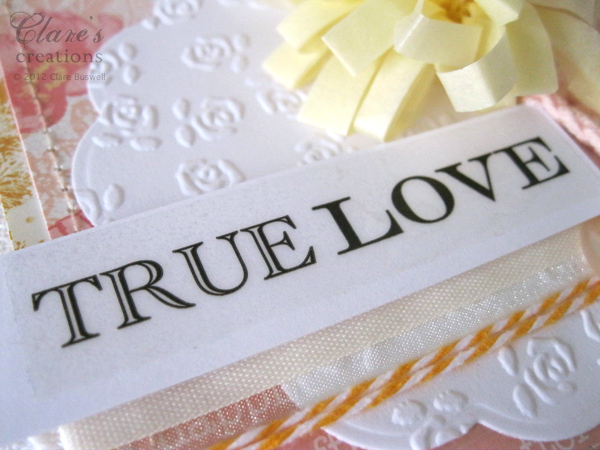 And I love the colors in the papers and twine, plus that crochet heart is simply sweet. Congrats on being a Moxie Fab Tuesday Target for this absolutely delightful card! Sooo pretty! Congrats on your win at TT! Congratulations on your TT win Clare! I love your tissue pom pom! YEAAAHHHH!!! Congrats Clare - I knew this one was a winner! Wonderful textures and such soft colours.